This 19-page white paper produced by NXP explores best practices for governments developing and implementing a national program for electronic IDs to ensure security and convenience while reducing costs. 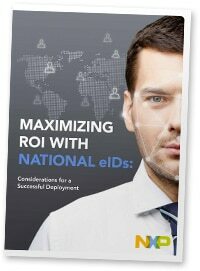 ‘Maximizing ROI with national eIDs: Considerations for a successful deployment’ begins with an overview of the benefits provided by electronic IDs, which include increased security, lower transaction costs and greater citizen satisfaction. The paper then goes on to explore the best way to start developing such a system, looking at the legal mandates and technologies involved. It then outlines the best practices for implementation and takes a look at three real-world rollouts where government agencies have worked with NXP in Luxembourg, Oman and Nigeria, and the lessons learned from each case’s individual level of complexity. This white paper has been produced and sponsored by NXP and has been approved by the NFC World editorial team. This 19-page document is available free of charge to NFC World Knowledge Centre members (PDF format, 532KB). This item is part of the Identity Knowledge Centre.